There are conferences aplenty in South Africa and Africa that plug into the maritime domain, but this week’s South African Maritime Industry Conference (SAMIC) hosted by SAMSA can truly be heralded as one that should repower the engines of the maritime industry in the country. I sat there for the entire conference. I did not miss a minute of it. I ensured that every break-away group had a representative from the magazine in it – and we will publish a thorough and comprehensive report back of SAMIC in the next issue. For those of you who did not attend and had to rely on newspaper reports of the highlights and headlines relating to the conference, please take comfort in the fact that the news that made it to daily newspapers relating to lack of legislation to bolster a ship registry; loss of bunker only opportunities or our lack of pollution fighting capabilities, should not be seen to represent the the entire focus of the conference. These are all headlines that spotlighted the industry during the SAMIC week and, while I am certainly not dismissing the importance of these facts, we as an industry know we are committed to addressing them, but we should also be able to walk away from the conference knowing that we did more than just air our dirty laundry. Three Cabinet Ministers stood on the jetty in the V&A Waterfront on a dark cold winter’s morning to watch the SA Agulhas training ship depart with 32 cadets on board. That’s three Ministers who now have more of a personal glimpse about what the industry can offer to young South Africans. The new Minister of Transport, Ben Dikobe Martins, seemed well briefed and sounded committed to prioritising maritime matters in the Department of Transport. Ruth Bhengu, Chairperson of the Portfolio Committee on Transport invited the industry to “knock on my door” to unblock policy and legislation before parliament. Bridgette Gasa, National Planning Commissioner, admitted that the maritime sector had been “forgotten” in the National Development Plan and agreed to seek to correct the oversight. A complete pipeline of skills development from primary to tertiary level for the maritime industry is being discussed at governmental level. The Petroleum Agency reported that our offshore acreage is well marketed and fully subscribed with either exploration licenses or applications for exploration. Increased activity in this sector is predicted in the next three to five years. SAMSA launched an Industry Training Fund and raised significant funds directly at the Chairman’s Dinner on the second day of the conference. CEO of SAMSA, Tsietsi Mokhele was summoned to meet with the President on Thursday and returned to alert the industry to the fact that he had proclaimed himself the governor of the Tenth Province to the presidency in an effort to convey the immense importance that the sector holds for the development of South Africa. Entrepreneurs waiting to gain a foothold into the industry, stalwarts of the industry, government agents, neigbouring country officials, NGO’s and industry associations rubbed shoulders, debated, discussed and committed to a robust maritime sector. The atrophy of conference delegates on the Friday afternoon was not significant! Was SAMIC an all-encompassing solution to every problem facing the industry? Certainly not, but it was an excellent start that challenged the status-quo of conferences as a whole and the industry. We were not subjected to paper after paper, but rather given the opportunity to huddle down and shout out our opinions. Was SAMIC totally representative of the industry? Well – no, there were a couple of industry players that perhaps should have been involved. Most notably was the absence of any representation from the Department of Agriculture, Forestry and Fisheries to engage with the fishing subsector, but there were others as well. Was SAMIC completely unique in its topic selection? Hell – no, there were issues that have been debated at nausea for more than a decade in the industry, but there seemed to be an underlying will on a higher level than just industry frustration to move forward. There is still a lot of work to be done. There is a lot of sensitisation to and education about the industry that still needs to happen at government level, but our new governor of the 10th province is the kind of man that has the ability to rally the troops; he has the passion to unite disparate sectors and he certainly seems to have managed to reach the ear of the president. And for those of us that added our rock to the pile – let us live up to the commitment this symbolised and work to make our 10th province prosperous, influential and peaceful. 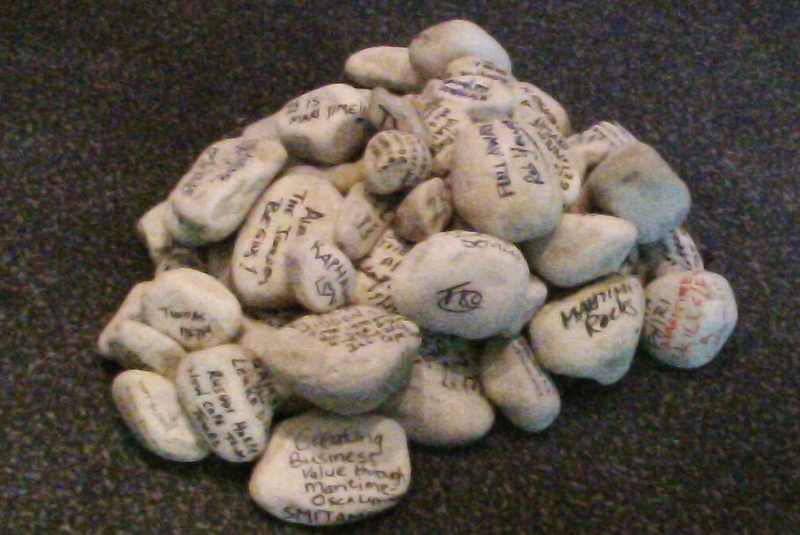 MARITIME ROCKS: Delegates at SAMIC were invited to take a rock, write their commitment on it and add it to the pile at the end of Day 2 at the conference. Deven, I am not sure what type of learnerships you are looking for. Please send me an email on editor@maritimesa.co.za with more details and I will try to direct you in the right direction.